Mesh chairs have become one of the most popular types of office chairs. Mesh offers a unique sitting experience and a look that cannot be replicated by any other type of upholstery. Because of their popularity, there are literally thousands of different mesh office chairs. How do you know which mesh chair is best for your needs? That can be a difficult question to answer with so many options available. We have done our best to help you answer that question with this list. We have used the data from our many years of experience selling mesh chairs, along with our personal experience using them to compile this list. This list has a variety of mesh office chairs that are best suited for specific applications. Our picks may not necessarily be the only options and they may not even be the absolute best choice for you. 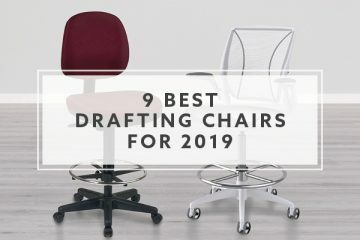 But this list can provide a nice groundwork for what is available and what to look for when shopping for your next mesh office chair. 12. What is a Mesh Office Chair? 13. How Did We Pick Our Best Mesh Office Chairs? It is only fitting that the chair that starts off our list is the chair that started it all with mesh seating. The Aeron has revolutionized the office chair market since it came out in 1994. The Aeron is our pick for best all mesh chair because it is the most well rounded mesh chair that we have had a chance to use. 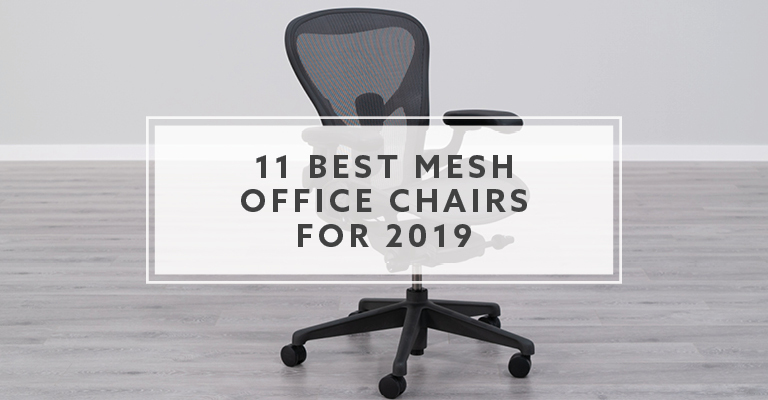 It is currently ranked #4 on our list of best office chairs for 2019, which is the highest ranked mesh chair on the list. 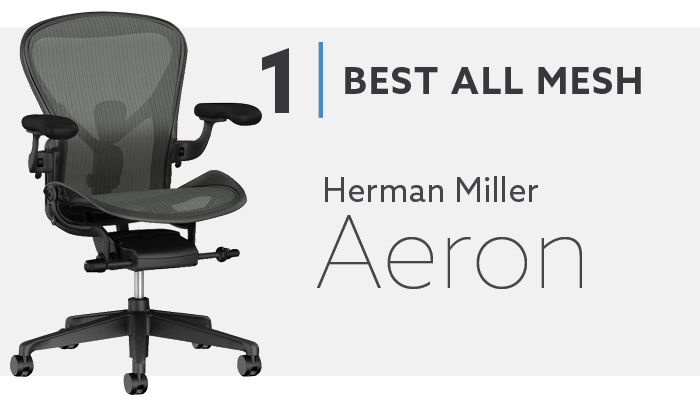 The Aeron is made in the USA and has the best build quality we have seen on an office chair. It also has an attractive design and is even featured in the Museum of Modern Art. The Aeron is backed by one of the best office chair warranties out there, with 12 years of coverage for people weighing up to 350 lbs. Herman Miller also warrants the chair for 24/7 use so you can use it around the clock in call centers or dispatch areas. The best thing about the Aeron’s build, when compared to most mesh chairs, is that the 8Z Pellicle mesh used is among the best quality mesh available. It is soft and supportive, but also holds its shape really well. The Aeron also has good functionality. It has a really nice recline function with multiple tilt lock and tension options available. The optional lumbar adjustment system is great for providing good lower back support. The Aeron also has some of the most comfortable arms out there. They have a wide adjustment range and the arm pads themselves are comfortable to use. One potential drawback is the metal frame on the Aeron. The seat has thick side frame pieces that are meant to cradle you in the chair, but can be uncomfortable to lean against. The back also has a thick frame, so there are times when you can feel it if you are moving around in the chair. The Aeron comes in three different sizes so one chair doesn’t fit all. This makes the Aeron a more custom fit for each person, so it may not be the best option if more than one person will be using the chair. The CXO chair from Nightingale is an absolute tank. This is the heaviest and most solid mesh chair on our list. It has good build quality, coming out of Canada, with a weight capacity of 350 lbs. It was our pick for best with headrest for a few reasons. The CXO’s headrest is padded with ENERSORB™, which is Nightingale’s memory foam. This makes it soft and allows you to sink into it. The headrest is height adjustable and can tilt, so you can get it in the most comfortable spot on your neck and head. The Headrest on the CXO also has the added bonus of a built-in coat hanger on the back. I have only seen this on a few office chairs, and it is actually a really handy feature. The headrest on the CXO is great but so is the rest of the chair. You get the same ENERSORB™ foam on the seat and adjustable lumbar support. The seat is really thick, and it is a nice option for people that like a seat that lets them sink into it a bit. The CXO also comes fully loaded with ergonomic adjustments, including 4-way arms. 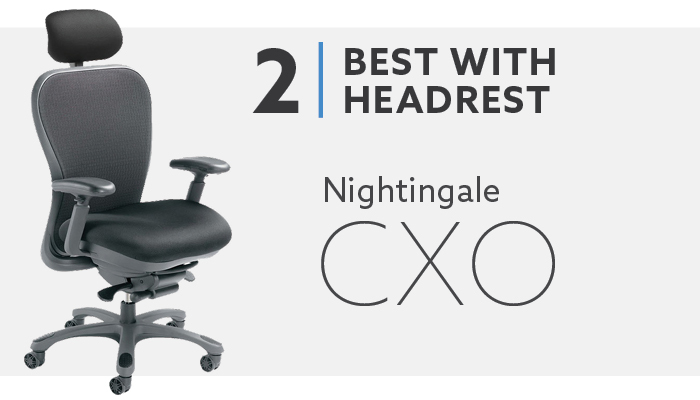 The CXO is one of the most adjustable chairs on our list and could have also been a pick for best ergonomics but the headrest is just too comfortable. One downside to the CXO with headrest is that it will not work for people less than 5’3”. The headrest will push the top of your head forward instead of cradling your neck. This is pretty common with mesh chair headrests. If you are less than 5’3”, I would recommend a mesh chair without a headrest. The next potential issue is the ENERSORB™ memory foam used on the seat. While this certainly sets it apart from its peers, it won’t be the best choice for everyone. Some people do not like memory foam and others do not like a thick, soft seat. 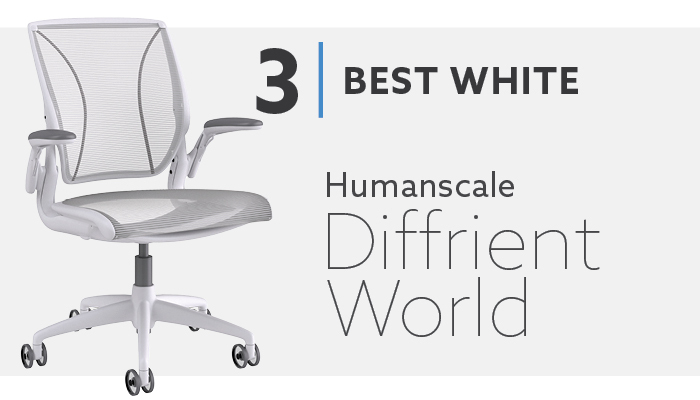 The Diffrient World chair is our pick for best white mesh office chair. There are a few mesh chairs that have white mesh options or white frame options, but the Diffrient World is available with a white mesh seat and back, with a white frame finish. There are a couple of grey accent areas, like the casters and the cylinder, but the rest of the chair is white. The chair looks really clean and has a high-end modern design. The World chair is a high-end chair with good quality mesh. It is comfortable on your skin and has nice flexibility. The mesh lets you sink in a bit and it flexes based on your weight and shape. The backrest features a tri-panel design, which allows it to conform to each individual person. It provides good comfort and good lumbar support. The seat was designed without a front edge to help eliminate the problem with pronounced frames we see on a lot of mesh chairs. The Diffrient World was designed to be as simple to use as possible. It has three basic adjustments: seat height, seat depth and arm height. The chair reclines based on the amount of weight being placed on the backrest. You do not have to manually adjust the backrest with tension or locking functions. You can upgrade to 4D arms, which adds quite a bit of adjustability to the chair. The 4D arms are a much needed upgrade for tasking applications. Because of the high-end look, light weight and basic functionality, the Diffrient World can be a nice conference room chair. The front of the seat does not have an edge, but the sides of the seat do. It may be uncomfortable if you shift your weight too far to the side and run into the frame. The lack of adjustability may also be a problem for people that like to have their chairs fully loaded with adjustability. The recline function is a bit different than most chairs with the back of the seat raising up as you recline. It is meant to put your hips at an open angle, to allow you to task while leaned back. Not everyone will like this style of sitting. The Ergohuman Mesh, also called ME7ERG for its model number, is an all mesh chair with headrest. It has been on the market for more than a decade now and has become a very recognizable chair. The Ergohuman features a backrest that goes as high as 30.5”. The backrest and headrest are each height adjustable. The headrest can also pivot. The headrest on the Ergohuman Mesh is not padded. It is designed just like the rest of the chair with pulled mesh across a frame. It is designed to go in the curve of your neck and can support you at any point in the recline. Along with the adjustable headrest, the Ergohuman is also known for its phenomenal lumbar support. The lumbar is its own section on the backrest and it is designed to flex based on the weight of the person in the chair. The backrest height allows you to get it in the correct position and the chair provides constant lower back support. The Ergohuman also has good adjustability, with a seat slider, tilt lock, tension adjustment and adjustable arms. The Ergohuman is designed to be a chair that can be a one size fits all option. It has been a popular option because it offers similar functionality and mesh quality for a much lower price than chairs like the Aeron. The Ergohuman is another chair with a noticeable frame on the seat. Raynor put a piece of foam padding at the front which helps to keep you from feeling the front of the frame, but the sides may be uncomfortable if you lean on them. The next possible downside is that the Ergohuman’s backrest does not go fully upright. If you like to sit straight up and want your backrest to be supporting you, then the Ergohuman will not be the best chair for you. The Akir chair is a mesh back chair that comes in a mesh, leather or fabric seat. This is our pick for best black mesh chair because it is completely black and has a sleek look for a mid market chair. The mesh, frame, base, cylinder, arms and casters are all black. The chair has a weight capacity of 300 lbs. and comes with a strong warranty. The Akir has really good adjustability. It has almost any adjustment you could ask for in a mesh office chair. The adjustable lumbar support is nice for good lower back support and the 4-way arms are great for tasking. There is also the option to add an adjustable headrest if you want to have head and neck support. Our favorite thing about the Akir is the comfy seat. The Fabric seat has good padding that allows you to sink into the chair. 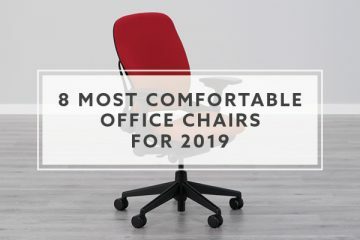 The seat on the Akir was ranked as the most comfortable seat on our list of best office chairs for 2019. The Akir provides nice value because you get a highly adjustable chair that has good comfort at a price of less than $500. 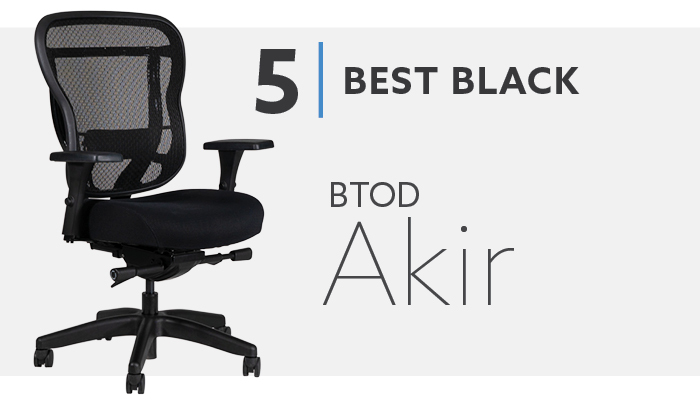 While the Akir has good functionality and a solid warranty, its build quality isn’t on the same level as the chairs ranked above it on this list. It has decent components, but it also has some lower end parts to help keep the cost down. Another concern is that the arms do not go as low as many of the other chairs we have seen. This can be an issue for people that like to lower their arms to be out of the way of things like a keyboard tray, desk or table. 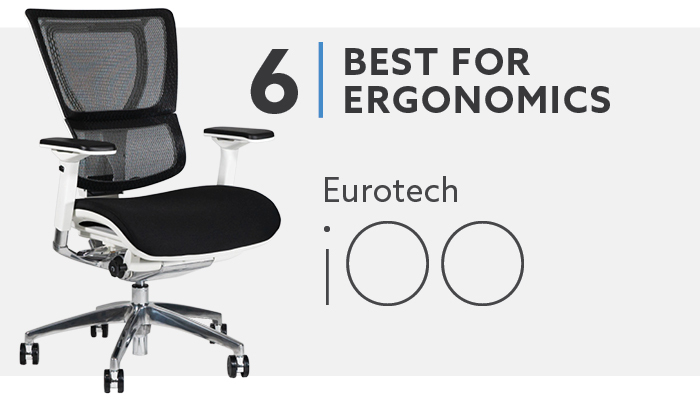 The iOO chair is similar to the Ergohuman but it is our pick for best mesh ergonomic chair because it is even more adjustable than the Ergohuman. The iOO has every adjustment we look for in an ergonomic chair. It has seat height and depth adjustment. It has a synchro-tilt mechanism with tension control and four position tilt lock. It has back height adjustment and weight sensitive lumbar adjustment. The arms have height, width, depth and pivot adjustment. This chair is loaded with functions and you can opt for an adjustable headrest for even more functionality. The iOO comes in your choice of a black or white frame and a mesh or padded fabric seat. The padded fabric seat provides good comfort. The iOO is like the Ergohuman with its lumbar design and also provides great lumbar support. The backrest on the iOO is one of the favorites in our office for back support. The iOO isn’t the same quality as chairs like the Aeron or CXO but the mesh is still good quality and the chair functions nicely. This chair can be a nice alternative to those high-end models for people that don’t want to pay such a high price. The biggest downside on the iOO is that the backrest will not support a fully upright position. It will be at a slight recline when at its most forward angle. The next thing that may be a problem is that shorter people may need a footrest. The minimum seat height is 20” so we would recommend a footrest for people less than 5’9”. The Diffrient Smart chair is our pick for best mesh computer task chair. This chair is similar to the Diffrient World chair that was picked for best white mesh chairs. The Diffrient Smart chair has a padded seat while the Diffrient World has an open mesh seat. The Diffrient Smart does not have a lot of customization with its mechanism free recline but is still a great option for tasking. The Diffrient Smart is designed to automatically recline based on the weight of the person in the chair. The one unique thing about the recline on the Diffrient Smart is that the chair does not rock like a knee-tilt or synchro-tilt mechanism. Instead, the back of the seat raises to open your leg angle, like we saw on the Diffrient World. This recline style allows you to keep your eyes on your screen, no matter how far you lean back. 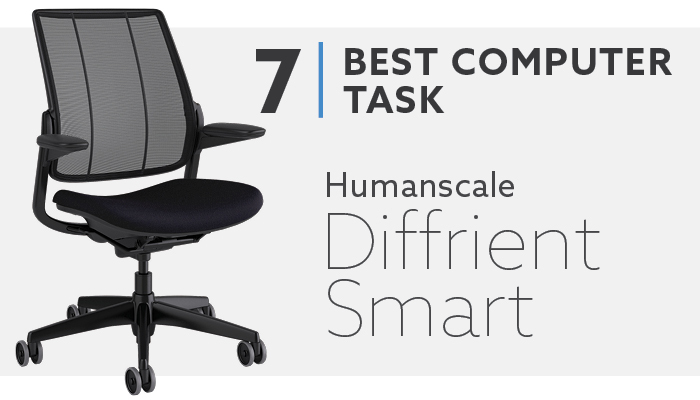 Other models will force your eyes up when you recline back, while the Diffrient Smart lets you stay on task while being able to constantly change positions. The armrests have good adjustability, while the arm pads are soft and supportive. The backrest features Humanscale’s tri-panel design and high-end mesh. The mesh conforms to your body and provides constant support, including the lumbar area. The seat has good padding and the flexible seat pan allow you to move around comfortably in the chair. Both the seat and back scored well in our comfort tests, when compared to the other office chairs we have tested. The first problem to address with the Diffrient Smart is that the arms do not have a maximum arm height to properly support people taller than 6’2” in an ergonomic position. The next potential issue is the lack of adjustments for the backrest and recline function. The weight sensitive recline is cool technology, but some people want more customization on their task chair. 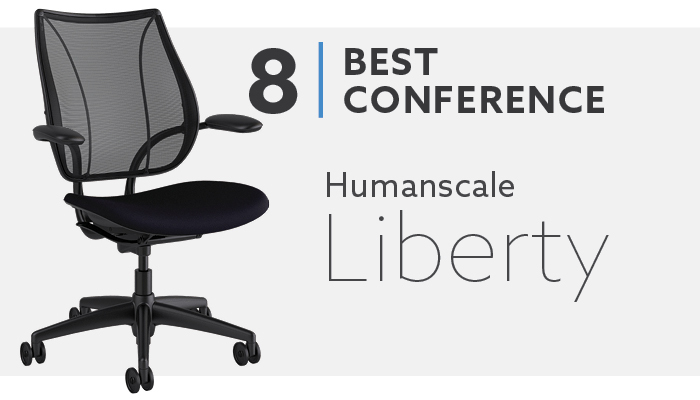 The Liberty is the 3rd mesh chair from Humanscale to be featured on our list. It features the same weight sensitive recline mechanism as the Diffrient Smart and World chairs. It also features a similar tri-panel mesh backrest that offers good overall back support. While it is similar in design and look to those models, the Liberty is better suited for a conference room. The Liberty features a high-end design with a sleek, minimalist look. The chair has a good build quality and it lightweight. It is one of the most attractive chairs on our list and it is also one of the most customizable. You are not limited to few color combinations or just black, like a lot of chairs on this list. You have a wide variety of mesh colors, mesh patterns, seat upholstery options and seat colors. This is a really great option for designers that want to create a unique conference room look. The Liberty is also well suited for a conference room because it is easy to use. It comes standard with only two adjustments: seat height and seat depth. This makes it easy for anyone to use the chair because you just need to make a few adjustments and you are in a comfortable spot. You can choose to go armless or you can choose between fixed or height adjustable arms. Both arm options have comfortable arm pads. They are soft and feel nice to lean on. The height adjustable arms are a nice addition for conference rooms that tend to have longer meetings because they offer a more comfortable option compared to the armless or fixed arm options. The height adjustable arms have good range and can be lowered almost as low as the seat, so they can easily be out of the way of the conference table. The biggest downside with the Liberty is the lack of adjustability. With only three possible adjustments, this is the least adjustable option on this list. The lack of adjustability will make it difficult for most people to be in a proper ergonomic position. For this reason, the Liberty is not the best task chair and it may not be the best option for conference room applications where meetings last for long hours on end. The Vera is another product from Eurotech Seating to make our list, but it is available for a much lower price than the Ergohuman or iOO mentioned earlier. 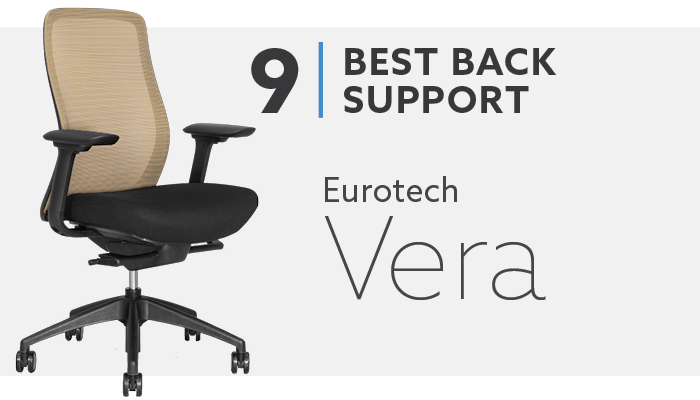 While the Vera is a lower quality product than those options, it still received the highest back support score out of all the office chairs we have tested. The Vera has the highest back support score, at an 88/100, by a wide margin. The back does not have any height adjustment or lumbar adjustment, but it has a nice natural curve. The shape of the back allows you to naturally sink in and utilize the full backrest. It provides good lumbar support but also good mid to upper back support. The mesh on the Vera cradles you more so than other mesh chairs that feel as though you are resting on top of the mesh. While the Vera has great back support, it also has a comfortable padded seat and good adjustability. It has 4D arms, a synchro-tilt mechanism, tilt lock and tension adjustments. It also has a seat slider to help ensure the seat is positioned correctly behind your knees. You can even add a headrest for more ergonomic functionality. The Vera does not have the high-end build quality like we see on the higher priced chairs on this list. The components and mesh will not be as nice. The mesh is flexible and supportive, but it is a bit abrasive. We have found that some fuzzy clothing, like sweaters, will leave material on the mesh. The minimum seat height on the Vera is shorter than most of the chairs on this list. Users under 5’4” should plan on using a footrest with the Vera. The GO-99-3-GG is big chair. It was our pick for best big and tall mesh chair because it features a mesh back with a weight capacity of 500 lbs. It has a 25.5” wide seat and a seat height range that is more suitable for tall people. It is also rated for 24/7 usage. This chair is designed with beefed up components to be able to hold 500 pounds in a round-the-clock application. Things like the casters, cylinder, chair base and arms are all designed to hold up to more demanding expectations. 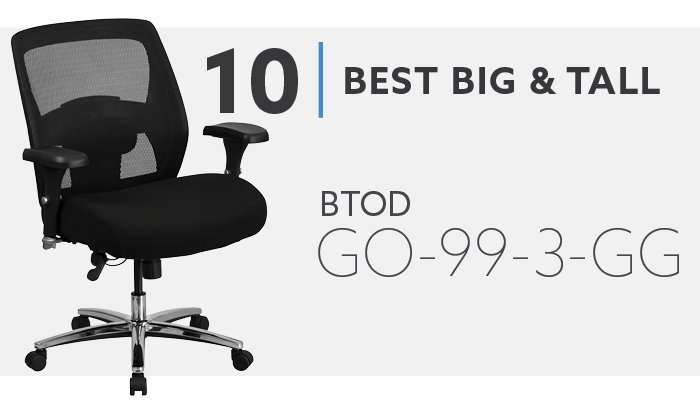 While the main focus of the GO-99-3-GG is to provide a mesh back option for big and tall users, it also comes with some functionality to make the chair more comfortable. It has a swivel tilt mechanism with tilt lock and tension adjustment. It also has height adjustable arms, a height adjustable backrest and fully adjustable lumbar support. The lumbar can be adjusted up/down or in/out. The biggest downside with the GO-99-3-GG is that it will only work for big and tall people. The seat and back are really large. The arms are too far apart for most people and they don’t have any adjustability other than height adjustment. The chair also does not have a seat slider to make the seat feel smaller. Another downside is that this chair is a lower end product coming out of China. In order to make the chair strong enough to hold 500 lbs., some corners had to be cut in other areas to help keep the price where it is. This chair has limited adjustability, lower quality components and a short warranty period. The mesh is not as soft or flexible as higher quality products. 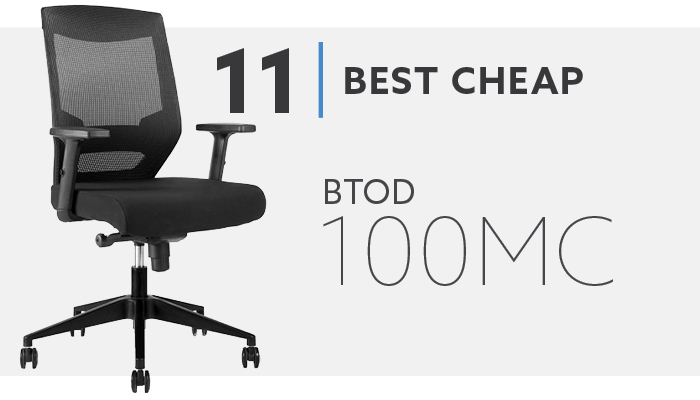 The 100MC is a nice entry level option if you are looking for a budget mesh office chair. For $199.00 you get a mesh back chair that has similar functions to those found in higher priced models. It comes with a synchro-tilt mechanism, 3-position tilt lock and tension adjustment. You also get pneumatic seat height adjustment and a height adjustable lumbar support. The 100MC comes with height and width adjustable arms to help keep you in an ergonomic typing posture. The backrest can sit fully upright, which makes this an attractive option for people that want a low priced, mesh chair that allows them to sit at 90°. The biggest downside with the 100MC is that it has a lower end build quality. This is no surprise for a best cheap pick. A chair that costs less than $200 cannot have the high-end components we see from the leaders in the category. It has limited functionality compared to higher priced chairs and the mesh will not have the elasticity to provide flexible support like better quality mesh chairs. The seat and arm pads are firm, which may be a turn off for some people. What is a Mesh Office Chair? A mesh office chair is pretty self-explanatory. It is an office chair that is upholstered with mesh. But there are different styles of mesh chairs. There is open mesh and padded mesh. Open mesh is just a single layer of mesh that is stretched across a frame. Padded mesh is a mesh upholstery that covers a padded seat or back. Using mesh upholstery over a padded seat and back is not that common. Mesh chairs are very common but there are numerous all mesh options and mesh back options. Chairs with all mesh will have open mesh on the seat and back. They will not have any padding. Mesh back chairs will have an open mesh backrest, but they will have a padded seat. The seat will typically be upholstered in fabric, leather or vinyl. How Did We Pick Our Mesh Chairs? There were a couple factors that went into the reasons for picking the chairs on this list. The first factor is our experience with mesh office seating. We have been selling mesh office chairs for almost 15 years. One of our very first sales was an Ergohuman ME7ERG. We know what makes a comfortable mesh office chair. We know the difference between good and bad quality mesh. We also have a lot of sales history to work with to determine which chairs our customers have liked. The second factor that we used to make this list is our time using the chairs on this list. We have used them, reviewed them and compared them against one another. We use the opinions of our entire staff to come up with scores for categories that we feel are too subjective for one person to determine. We have put a lot of time into becoming experts on mesh office chairs so that you don’t have to. Open mesh is much more breathable than upholstery with foam. Because open mesh allows for more airflow, it will provide a cooler sitting experience than foam with upholstery. This can be a big advantage for people that are in their chairs for a long time and tend to get hot or even sweaty in chairs with upholstery like vinyl or leather. Mesh chairs offering a cooler sitting experience is always promoted as a positive but that is not always the case. Some people do not want or need a cooler sitting experience and actually, prefer the extra warmth that a leather chair can provide. If you are a person that is typically chilly when others around you are not, then an open mesh chair may not be the best option. The quality of the mesh will make a huge difference in terms of comfort and longevity. Mesh can be a tricky material because you want it to be strong enough to support the person in the chair, but you also want it to be able to flexible and soft so that it is comfortable. High-end mesh will have soft fibers interwoven so that it is comfortable on your skin. It will also have good elasticity that snaps back in its original shape after being used. You do not want the mesh to start to permanently conform to the shape of the person using the chair. This will cause the mesh to sag over time and it will be less supportive. Lower quality mesh will not have all of these good qualities. Sometimes it will have good elasticity, but the manufacturer forgoes having some soft fibers woven in. This will make the mesh coarse and it can be abrasive to your skin and/or clothing. Other low end mesh may be entirely made of a softer material so that it is comfortable, but it does not have the elasticity to hold its shape, so it becomes unsupportive over time. Mesh office chairs have two main types of seat designs: an open mesh that is pulled across the frame or padded seats that are upholstered in fabric, vinyl or leather. These seats feel very different from one another. Padded mesh seats feel more like a traditional chair. So, you get the combined benefits of a well padded seat and a mesh backrest. This type of mesh chair is a safer pick if you are shopping for a large chair purchase or if you are on the fence about whether you will like an all mesh chair. This is also a nice option to avoid problems with noticeable seat frames on open mesh models. Padding helps to avoid sitting against an uncomfortable seat frame. Open mesh seats aim to provide more of a floating feeling. You are meant to feel like you are gently sitting atop the chair. They provide a very unique sitting experience that you can only find with an all mesh chair. They do feel a bit firmer than most padded chairs though. Open mesh seats can pose a problem with the frame. Since the mesh is pulled across the frame, there isn’t foam that can be placed on the metal frame to give you a buffer when you sit on it or shift your weight into it. On an open mesh seat, you are more likely to feel the seat frame than on a mesh back chair with a padded seat. 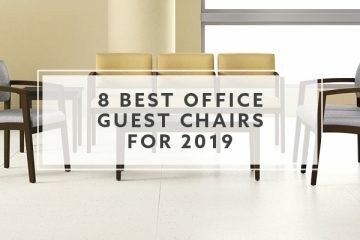 When I wrote our post on the 8 Best High Back Chairs for 2019, I learned a lot about what the industry considers a high back chair. It is important that you understand what a high back is if you are searching for a high back mesh chair. There are 2 different types of high back chairs. The first type of high back is a back that is designed to support your entire back, neck and head. These backrests will be somewhere between 28”-32”+ tall from the seat. The second type of high back is a higher back design than a mid or low back. It will provide lower back support and then it will support your mid to upper back, but it will not support your neck and head. These backrests will usually be about 24” tall from the seat. What I found with my research is that there are very few mesh high back chairs that support your entire back, neck and head without the use of a headrest addition. There are some options, but the selection is limited. 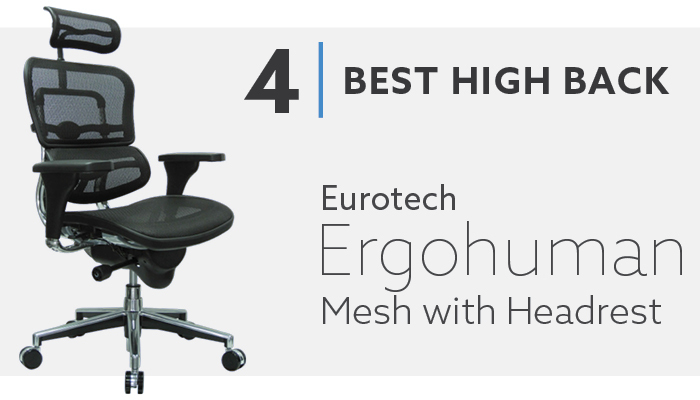 The best thing to look for if you want a mesh chair that supports your entire back, neck and head is to find a high back mesh chair with a headrest, like the Ergohuman or CXO chairs featured on this list. There are many different types of mesh office chairs. They range in style, price and function. They are all designed to serve different purposes. Some are better suited for tasking. Some are best for conference room applications. Others are nice for executive offices. It is crucial that you know what is important to you when considering which mesh office chair to purchase. This list has a lot of great options and should provide something for most people in search of a new mesh chair. If not, you can still use our list of things to consider, along with our picks for the various applications, to form a nice groundwork for how to find a mesh chair that is best for your needs. Herman Miller Aeron vs. Steelcase Leap: Which is better?